I have a 18 z06 and was looking at tire rack and I can get Continental extreme contact sport for $1,373.96 while the OEM michelin pilot super sport zp are $1,837.88. Any cons to the Continentals? Are the continentals also run flat? Call Tire Rack and ask, or I'm sure it's in the description on their website. Last edited by Steven Bell; 01-24-2019 at 07:28 PM. How do some guys pull it off with vettes with no run flats? What happens if you get a nail? I'd not recommend the extreme contact sports. Had them on my HPDE 350z and they were awful once heated up. Very slick, and noisy. I have Continental Extreme Contact DWS (Dry, Wet, Snow) on my C7....very smooth, low noise. Think ill spend the extra money and go for the OEM Michelins. I don't want to deal with the nuisance of an air compressor and patch kit. Last edited by desibaba; 01-25-2019 at 11:52 AM. Steven, when I looked up tires on tirerack these did not come up in 19/20 for a GS. Are you running 18/19s or an upgraded set up? Last edited by mtaxman; 01-25-2019 at 07:29 AM. The Michelin AS3+ for the Z is a great option... They are run flats and are great in the cold and wet. I put a new set on my Z and am really happy with them. many cars no longer have spares nor run flats. The manufacturer provides a combo fix a flat compressor kit available most anywhere for about $50. Tire is good for 50 mi and takes 7 min. The new compunds do not harm sensors. Many of the folks in our club nix the run flat in lieu of the solution I noted. The tires non run flat can be as much as $200 a tire cheaper and ride better and with that even if you have to flat bed to the nearest tire store can still be much cheaper. Bear in mind run flats are only good for 50 mi as well, and as we have learned on club trips, most tire stores in Podunk USA dont carry them in sizes of Vettes so most likely you are sitting a day ir two anyhow! If you are exploring TireRack, try www.discounttiredirect.com. Always cheaper than TR and Usually much cheaper when you buy around any holiday. I have not gotten a flat in many 100,000's of miles. knock on wood. If I did - Plug it and go. Never going back to run flats. Discounttiredirect will over night a replacement tire to your nearest Discount Tire Store if you get a flat. That is a good point on Discount over nighting a tire to where you are stranded. I have had 5 flats and only two have been repairable. No compressor would work on 3 of them even if I had a patch kit, etc. I needed one over nighted to me in Arizona. And it wasn't even a Discount store. I drove 80 miles to the nearest town with a tire repair store. I had a rebar go in the tire a rim as well. They patched the hole for me in the wheel and then could mount the tire for me to get back home and order a new rim. The did have another option of installing another model tire at no charge to get me back home the same day, but I decided I liked the little town and wanted to explore it anyway. I do likde the Michelin A/S + Z and on my third set. I get 30,000 out of them. And that's pretty good for me taking into consideration the way I drive. Last edited by joemessman; 01-25-2019 at 10:54 AM. Joe: wish I lived out where you are, great place to drive a vette. I vacation in Laughlin two or three times a year. Friends often say -- wow way too hot -- how about -15 windchill here today !! I love the desert. We all have the pluses and minuses where we live. I don't like to brag about the weather here, so I won't. But if you can stand hot weather four months of the year this is a good place to be. My electric bill this time of year is about $90. When the summer comes? $200 to $250. Wind chill here now? It is 62 but says it feels like 64. I guess what it "feels like" is the wind chill. Good luck! It'll be summer before you know it. 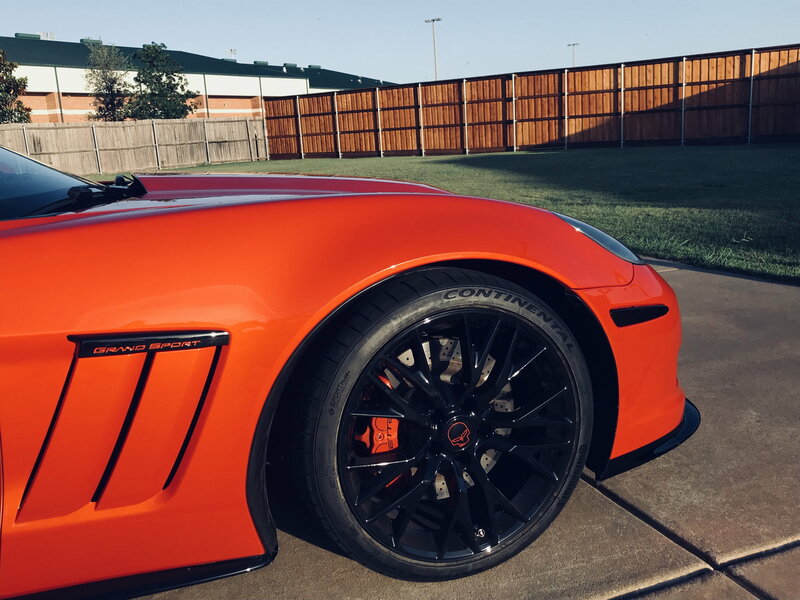 I have the Continental Extreme Contact Sport on C7 Z06 wheels, 285/30/19 front & 335/25/20 rear. Other than having issues balancing the fronts when I received them (Continental replaced both fronts under their 60 day satisfaction guarantee), they have been great so far. I've only driven 2300 miles in the last 12 months but when I do drive the car it's usually for a couple hours along curvy country roads. The tires have great grip, and I don't find them to be noisy. They are not runflats, but I keep a repair kit & compressor in my rear storage cubby. Many of my previous cars have not had spare tires and/or runflats & I've not had an issue. Last edited by JABCAT; 01-25-2019 at 02:30 PM. I like the Contis and run them on my 88, they are a good tire for the money. Not runflat though.